Trivia Time - Heads in beds...but how many beds?????? Hey everyone! Travis here with another Tampa Tourism trivia question...actually, this is some Tampa Bay hotel trivia. How many of you have ever stayed in a Tampa Bay hotel? Better yet, how many hotels have you had the pleasure of staying in? We have hunreds of hotels throughout the area providing thousands of hotel rooms. From North Tampa to South Tampa, east Hillsborough County to Seminole Heights, Ybor City to West Tampa...they are all over the place. 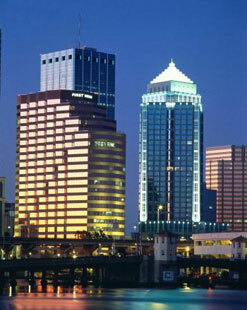 Well, today&apos;s question is simply this - approximately how many hotels rooms are in Hillsborough County? We know that we host groups of 10s of thousands of people...but where do they stay...how do we accommodate them? Well, you may be surprised at the answer, so get guessing! We&apos;ll be back later today with the answer, so keep checking back. And don&apos;t forget that Jerm will be posting this question on our twitter account, so keep an eye out for it, be the first to respond correctly, and you&apos;ll get a 2-hr gamecard from Gameworks in Ybor City. And keep checking back for more Tampa tourism information, and updates about great things to do in Tampa Bay!